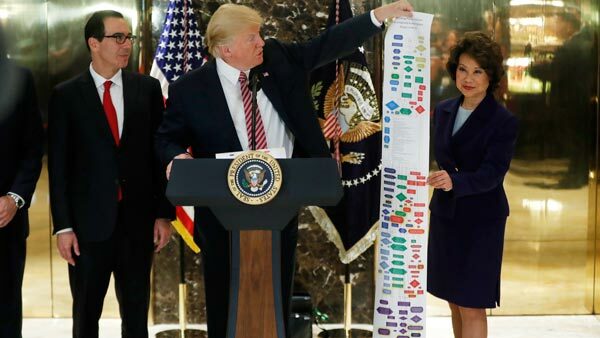 WASHINGTON -- President Donald Trump says he's signing a new executive order "streamlining" the federal permitting process to speed up construction of transportation, water and other infrastructure projects without harming the environment. White House officials confirmed that Trump's order includes revoking an Obama administration executive order requiring that builders take sea level rise driven by climate change into account when constructing projects in flood plains. Trump has suggested the predicted risks from sea level rise are overblown. The president, speaking at a news conference at Trump Tower in New York, said it can cost hundreds of millions of dollars and 17 years to approve an ordinary highway project because of burdensome regulations. This is Trump's second executive order aimed at streamlining infrastructure projects. Environmentalists say Trump is seeking to weaken environmental protections.